Thousands of drivers caught in a Newburgh Heights speed trap who fail to pay their citations are being misled into believing both their credit scores and financial future are at risk. The Village of Newburgh Heights has been operating one of 16 speed cameras that generate revenue for municipalities across Ohio. The village’s program has been a source of public debate since its inception in 2013. Last year it resulted in $2.4 million dollars in revenue before expenses, according to Newburgh Heights Mayor Trevor Elkins. The program covers two locations, including a three-quarter-mile stretch of Interstate 77 (I-77) as well as Harvard Avenue – both going through Newburgh Heights. According to Elkins, the village expanded its police force, growing from no full-time police officers to six full-time officers with two patrolling the streets at all times. Newburgh Heights is a village of 2,000 residents that covers half a square mile. “This program has allowed us to keep our streets safer,” Elkins said. The village hired a police officer in July of 2015 for traffic enforcement that includes the handheld laser camera on I-77 along with the fixed cameras on Harvard Avenue. Our six-month-long investigation examined the tactics employed by the village to encourage speeders to pay up. This comes after a News 5 reporter’s ticket led to questions about the program. In a 2014 town hall meeting , a January 15th, 2015 official village news release and again earlier this month in a news conference about the program, Elkins repeatedly echoed the warning of “damaged credit scores,” “placing it on credit reports” and harming drivers’ financial future. But we checked with the trade association for the nation’s major credit reporting agencies, and they told us a different story. “No matter what they are telling consumers about data going to credit bureaus, it is not going to credit bureaus,” said Eric Ellman, senior vice president with the Consumer Data Industry Association , which represents the nation’s credit bureaus. “That data does not come to credit bureaus." 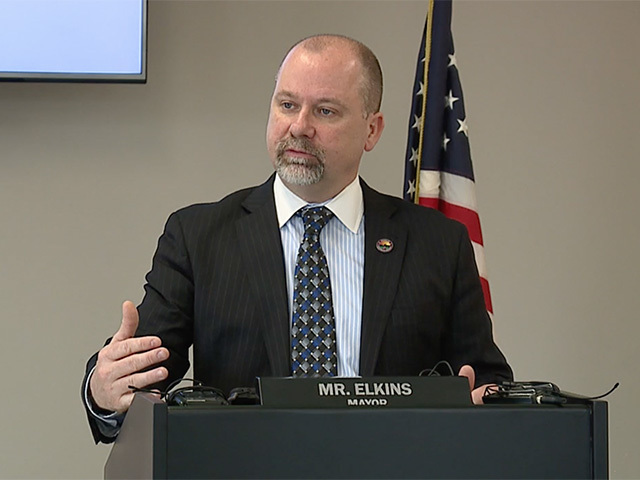 Elkins said if drivers fail to pay up, they could be subject to civil lawsuits and eventual monetary judgments or liens placed against their property that credit agencies will collect and use. We do not agree that the language on the notice of liability is inaccurate or misleading. Although we have not engaged in this activity, the village maintains and reserves the right to report the failure to pay an outstanding notice of liability to any of the credit reporting agencies. We cannot control what the agency does with this information. We are confident however, that should the village secure a judgment, it is likely to be of interest to the credit reporting agencies. This is why we believe our statement is not inaccurate or misleading. 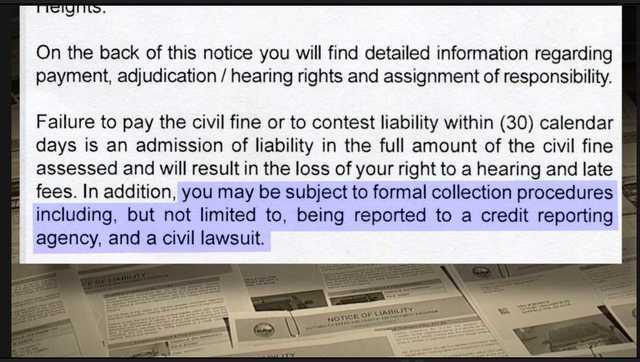 However, in response to your comments for greater clarity in the language, the village does intend to amend this portion of the notice to read: ...subject to formal collection procedures including, but not limited to, a civil lawsuit in pursuit of a judgment in a municipal court of competent jurisdiction. Under the law, drivers can be fully prosecuted in municipal court for failing to pay civil fines, like speed trap citations, and liens can be placed against them. But Reville does have concerns over speed traps like Newburgh Heights’, where the officer is high above I-77 on a bridge and essentially out of sight. “I have no issue paying for my mistakes, but when you have an officer who is invisible in the flow of traffic, it seems more like a revenue generator,” Reville said. Elkins admitted the speed trap does create revenue. “I am not the mayor that’s going to get up here and tell you that these don’t generate revenue and try to pretend these don’t have benefits,” Elkins said. Since the fall of 2015, nearly 23,000 drivers were cited for speeding on the three-quarters-of-a-mile stretch of I-77, with civil fines ranging from $150 to $300. Had they all been paid, it would have resulted in more than $3 million in fines. Records obtained from Newburgh Heights also show at least 5,000 drivers of those cited during that time have failed to pay fines. Are the laser speed cameras effective? Our investigation found little evidence the speed trap program on I-77 in Newburgh Heights has been effective in either decreasing crashes or reducing the citations issued for speeding. We reviewed accident reports and found only four crashes in the two years before the speed camera program was launched. Since then, accidents have increased to at least 12 in 2016 and 19 in 2017. 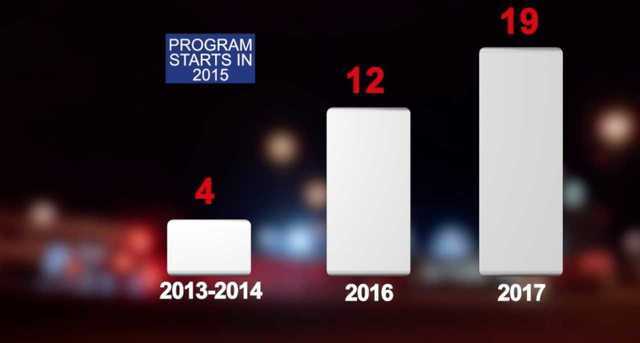 At the same time, Elkins said the number of speeding tickets has remained level each year throughout the program. 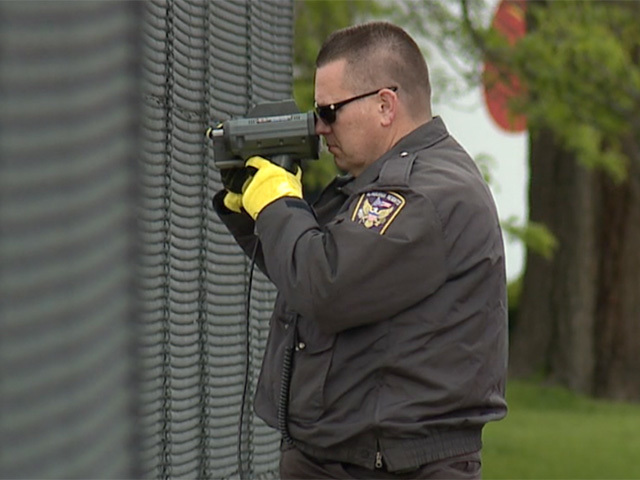 Meanwhile, efforts are building in the Ohio legislature to limit municipalities like Newburgh Heights from generating revenue on speed camera citations. The Supreme Court has repeatedly upheld local speed camera programs. Last month, House Bill 410 overwhelmingly passed and would cut into state funding for these programs. The Senate has not yet voted on the measure. If drivers choose to contest tickets, they can file any appeals directly with Garfield Heights Municipal Court, which hears traffic cases arising from the Village of Newburgh Heights.